Podiatrists, chiropractors, physical therapists, and athletic trainers are often the first healthcare practitioners to detect leg-length discrepancy (LLD, also known as limb-length discrepancy or short-limb syndrome). If the presenting complaint is not where the primary dysfunction is found (for example, knee pain as a result of faulty foot biomechanics), creating a treatment plan is an interesting clinical challenge, especially in a multidisciplinary setting. Healthcare practitioners are caught in a conundrum, because different professions might use a variety of criteria for testing, communicating about, and treating a patient’s condition, thus creating inconsistencies in diagnosis and management. Across professions, there may be debate about whether length discrepancy is a cause or an effect. This is a classic chicken-or-egg cycle encompassing a variety of closed-chain, biomechanical dysfunctions that result in pathology. In response to inconsistencies we have witnessed across many professions regarding limb length pathology, we aim to provide context and clarity about LLD in this article by 1) redefining and creating universal terminology and 2) introducing a clinical assessment tool, the Sanford Symmetry Scale© (page 26) that can be used across professions. Type. The 3 types of LLD are outlined in Table 1. It is important for the practitioner to resist assigning a single type of LLD to a patient because each type may be a cause or an effect, and the 3 types are not mutually exclusive; for example, a person might have an anatomical LLD with a functional component. Chronicity. Is the LLD acute or chronic? The treatment plan (exercise, manual therapy, heel lift, orthotic, spinal alignment), the rate at which treatment is introduced, and the prognosis are vastly different, for example, for a patient who has acute LLD postoperatively and one who has chronic LLD resulting from a congenital defect. Regardless of the cause of an LLD, examination of, and a treatment protocol that addresses, the entire closed kinetic chain is essential. Without a complete picture, background, and context, a practitioner may be unable to fully comprehend, or communicate, the sequelae of problems. This is a critical component in 1) developing a multifocal treatment plan that considers the ability to tolerate correction and 2) understanding the role played by the altered neuro-musculoskeletal system, before and after intervention. Although we agree that distinctions among structural, postural, and dynamic types of LLD are relevant, we do not agree that structural and postural LLD are mutually exclusive or that there are only 2 types of LLD, and we do not agree with the general consensus to indiscriminately treat all 3 types of patients with a heel lift. The closed kinetic chain is complex and unique to each patient, and no definitive formula fits every patient’s primary dysfunction or neuro-musculoskeletal compensation. We also recognize that structural, postural, and dynamic types of LLD are, as noted, not mutually exclusive. Length of time that the patient’s neuro-musculoskeletal system has compensated for (perhaps adapted to) the LLD. It is critical that the practitioner investigate all of these variables, for each patient, and design a treatment plan unique to each one’s LLD, compensation, comorbidities, age, and lifestyle. We encourage you to pay as much attention to any abnormal compensation pattern as you do to the LLD itself. It is well documented that abnormal biomechanics, such as you would find in a compensatory pattern, can result in vibratory forces and microtrauma along the closed kinetic chain (Figure 1). The spinal facet; hip, knee, ankle and foot joints; and their associated muscles may suffer repetitive microtrauma resulting in sprain, strain, or degenerative joint disease. By addressing compensatory neuro-musculoskeletal function, you may be able to assist the patient with a cascade of dysfunction through the musculoskeletal system. 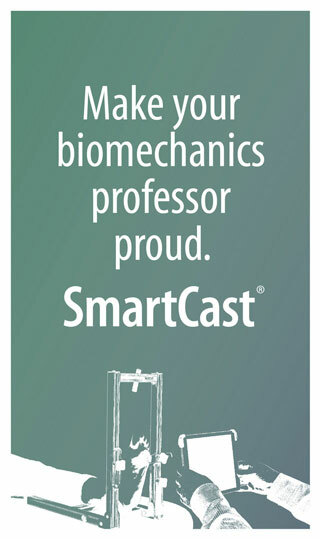 We also encourage you to make use of gait assessment technology to quantify, document, and monitor patients’ progress. Application of reproducible, documented metrics is essential to communicate effectively within a multidisciplinary system that is committed to practicing evidence-based medicine. Know your patient. Understand the multiple roles in his (or her) life: Is he an athlete? A senior? A sitting worker, chronic pain sufferer, weekend warrior, or standing worker? Discover his goals. Does he want to run a marathon? Dance at a wedding? Walk more to lose weight, control blood pressure, or manage diabetes? Or just sleep through the night? Communicate, educate, and set realistic timelines. Avoid dumbing-down your explanations. To accommodate visual and auditory learners, use pictures as well as providing explanations. Let the patient know that a return to balance is a gradual, sometimes slow, process. Emphasize that ideal balance might not be achievable; the goal should be improvement, not perfect balance. Avoid the silver bullet. A patient’s biomechanical and pathological condition is rarely a single diagnosis and is rarely due to a single factor. For example, a knee injury incurred in young adulthood may lead to degenerative changes and contralateral compensation through the hip, knee, and foot, presenting as plantar fasciitis. With these 4 core elements of the initial approach to the patient and his problem, the history and examination will be more productive. Figure 1. The closed kinetic chain at impact. 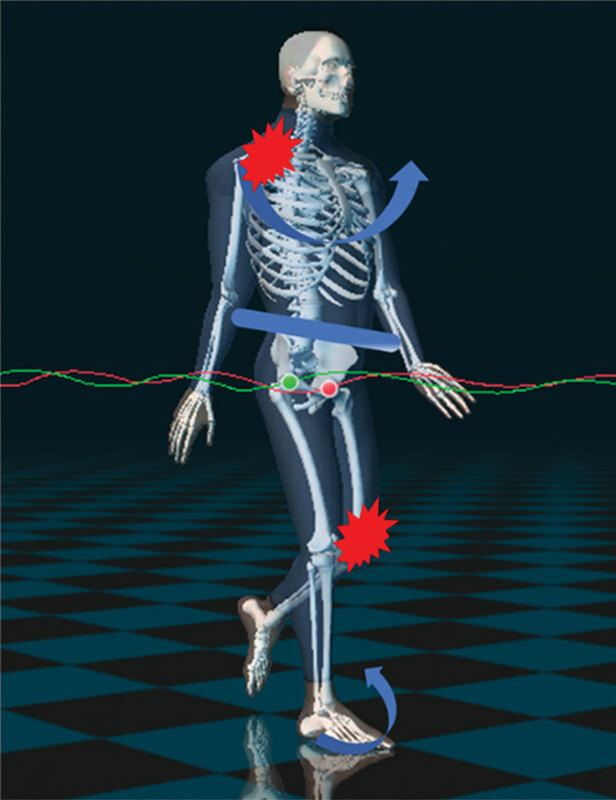 The closed kinetic chain is represented using computerized-assisted gait assessment (CAGA) technology to demonstrate intrinsic relationships occurring at impact. Patients tend to not understand all of the factors that have contributed to, and continue to be related to, their LLD. Ask the patient to recount family history (including congenital disorders), trauma, surgery, chronic conditions, and ongoing repetitive stress that he might not realize has contributed to his musculoskeletal imbalance. Some of the most common historical indicators of LLD include trauma, fracture of the growth plate, scoliosis, joint replacement, severe arthritis of a weight-bearing joint, surgery of a weight-bearing bone or joint, congenital hip dysplasia, and any other congenital anomaly of a weight-bearing joint or bone. We have found that demonstrating the closed kinetic chain to the patient is a useful educational tool while discussing the possible sources of postural asymmetry (Figure 2). For example: Have the patient stand and externally rotate his left hip so that the left foot is abducted and the whole left column has been shortened. 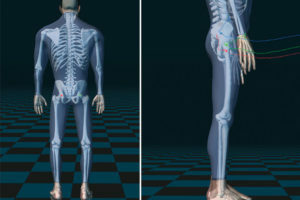 Then, explain that, although it appears that the leg is short, the bones themselves have not changed; rather, the LLD is the result of postural and soft-tissue imbalance, and that, in rotating the hip, he has altered the relationship between muscle groups and bony alignment without changing the actual length of bones. This type of demonstration enhances history-taking and helps the patient understand the impact of his ADL (Figure 3), posture at work, sitting position, and movements during sports. When you assess and address a set of concerns, it helps to not only to know the history of when the problem started but also the history of activities seemingly unrelated to the problem. For example, knee pain in a soccer player͛ may require strengthening, change in technique, recovery routine, and exercise–dose response, in addition to addressing the LLD. Keep in mind that it is easier to see improvements when a patient participates in a sport than when the complaint is related to ADL, which makes it more challenging to uncover the core of the problem and then measure progress. Once you have taken a comprehensive history, there are certain findings on the physical exam that should lead you to suspect an LLD and, possibly, a compensatory pattern, such as 1 pants leg shorter than the other (ask if 1 leg of the pants is shortened more than the other when visiting a tailor) and a unilateral foot-centric abnormality (e.g., bunion, bone spurs, keratosis, and arch drop). Other common findings on the short leg side include a unilateral, relatively tight or short Achilles tendon and tender plantar fasciitis. You may also find palpable bone spurs and/or bony hypertrophy proximal to the medial longitudinal arch on the medial dorsal surface and imbalance in strength and laxity in tendon groups. Supine. Perform a bridge test (the Weber-Barstow maneuver test (Figure 4,4); also known as the Allis sign); a supine to long sit test; and a Squish test of the sacroiliac joint. Evaluate the anterior superior iliac spine for asymmetry. Standing. Evaluate for head tilt, shoulder drop, tibial tubercle height asymmetry, anterior superior iliac spine, posterior superior iliac spine, trochanter height, asymmetric arch drop, and asymmetric pronation or foot abduction (Figure 5). Seated. Examine the medial malleoli, palpating for a specific, anatomically pronounced area on both prominences. Compare the medial malleoli bilaterally. Figure 3. Effects of activities of daily living. Activities such as carrying a heavy bag on 1 shoulder, reaching and lifting repetitively, or pushing work-related materials can result in musculoskeletal imbalance and a functional limb-length discrepancy. Asking questions about activities of daily living, apart from sport or work tasks, is of great importance and should be a focus during the first visit or session, at which time a baseline, objective report is essential. In this article, we present the comprehensive Sanford Symmetry Scale (page 26) as a guideline for the diagnosis and treatment of LLD. The Scale can be used to identify all 3 types of LLD and causative findings, using accepted clinical tests for a comprehensive musculoskeletal evaluation during the initial examination and reassessments. A score is given for each test; the higher the cumulative score, the greater the asymmetry. The purpose of the Scale is to establish a baseline and identify changes after treatments and interventions. The Scale is not intended to provide a threshold to determine the presence or absence of LLD. (The authors intend to submit the Sanford Symmetry Scale for review, validation, and evaluation.) After identification of an LLD using the Scale, a practitioner should use clinical judgment to arrive at a final diagnosis and establish treatment priorities over the short and long term. Figure 4. Webster-Barstow maneuver test4 (Allis test). With the patient supine with the heels off the end of the exam table, the examiner holds the patient’s feet together with hips and knees bent. The examiner places his or her thumbs over the medial malleoli while providing traction and instructs the patient to raise his hips upward and then return them to the starting position. 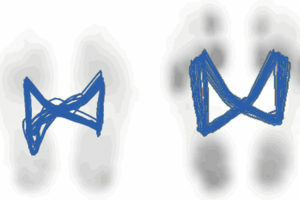 Any difference in the final position of the thumbs indicates asymmetry. As corrective techniques are introduced, the Sanford Symmetry Scale can be used to monitor objective changes. 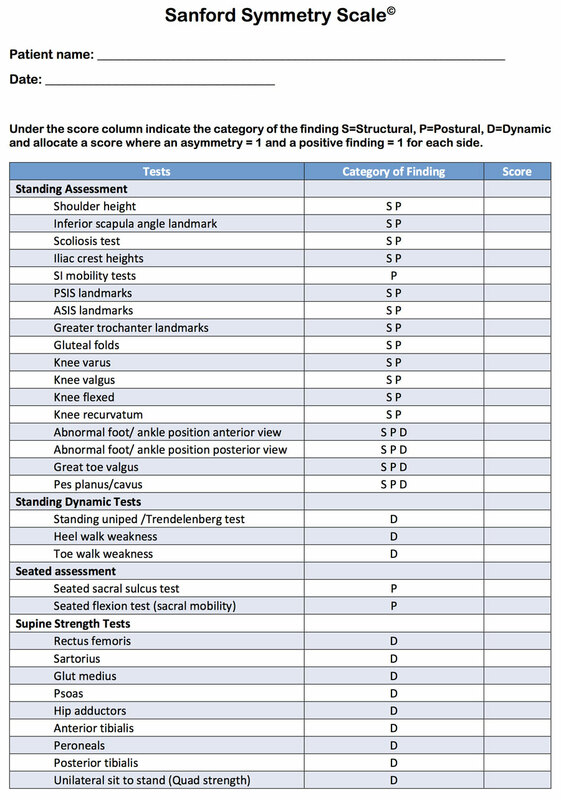 Because the full clinical picture may reveal itself only as the patient progresses through a treatment plan, it is important to perform all of the tests on the Sanford Symmetry Scale during each reassessment and document a changing or stable score along with the patient’s subjective report. To use the Sanford Symmetry Scale, it is essential to examine the patient in 5 positions: static prone, supine, sitting, standing, and during gait. The baseline exam and reassessment must include all of these positions. Examples: A patient’s right leg might be internally rotated in the supine position, which will functionally lengthen the limb when walking; or, an externally rotated foot on 1 side will cause the affected limb to behave as if it were short while walking. It is also essential to consider the bigger kinematic picture, neuromuscular control, and compensation issues. When you come across 1 finding, follow the path up and down the kinetic chain, which may include tests not incorporated into the Sanford Symmetry Scale. For example: If the gluteal and hamstring muscles are weaker on the left side than on the right side, the left leg tends to internally rotate, causing the foot to strike the ground in a more pronated manner, resulting in plantar fasciitis or arch pain. With this in mind, you may find that simple inspection, such as checking for head tilt; shoulder, breast, and hip drop; patellar position; spinal curvature; and increased foot abduction yield significant clinical indicators. A limp may be associated with acute or uncompensated LLD after trauma (sprain, strain, or fracture) or surgical intervention, such as hip replacement. A plodding limp, however, may also be associated with an LLD, which greatly increases the forces and malposition of joints in the kinetic chain. 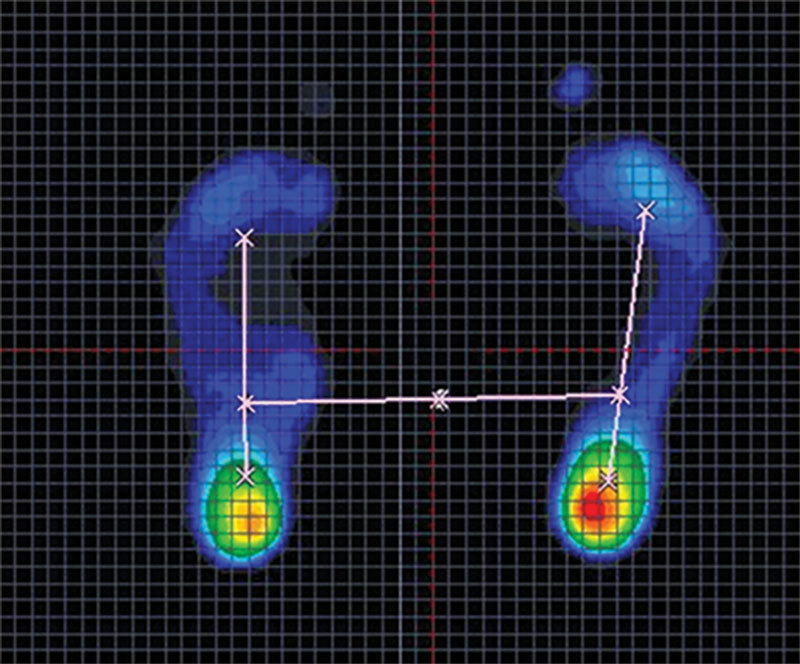 When the short limb spends less time in the contact phase of gait, pressure increases in the midfoot and forefoot during the stance phase. The result is transmission of damaging vibratory forces up the kinetic chain. Figure 5. CAGA lead placement. Leads in place are shown as blue, green, and red marks. Mr. Jones, you no longer have to limp. This is a bad habit that we can fix together. Please watch yourself walking on the screen and concentrate on getting your heels down and your toes up. Because you are rolling forward, making good use of momentum, this pattern makes walking easier and healthier. In chronic and compensated LLD, you will usually see a limp on the long side. 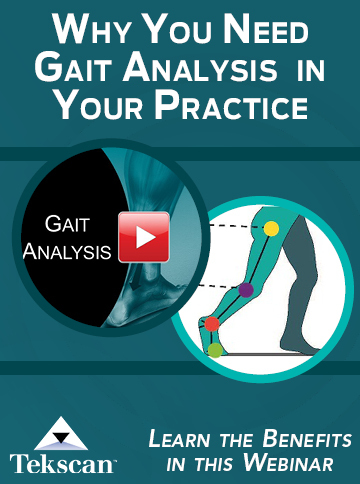 In a mild or early-stage case of LLD, the limp may be barely perceptible; this is when the metrics of a computer-assisted gait assessment (CAGA) system, discussed in the next section, can be invaluable. The various methods of measuring LLD can be categorized as direct, indirect, and radiographic. The direct method is conducted with the patient supine or standing. The practitioner uses a tape measure to determine, and compare, the length from the anterior superior iliac spine to either the medial malleoli or the lateral malleoli on each side. The indirect method is conducted with the patient standing on a heel or sole lift and the practitioner leveling the pelvic landmarks. CAGA is a more recent, functional tool used to detect and address LLD. Using CAGA, a practitioner can approach LLD from a dynamic and training perspective—incorporating surface electromyography-assisted biofeedback, video feedback, and quantified communication strategies. 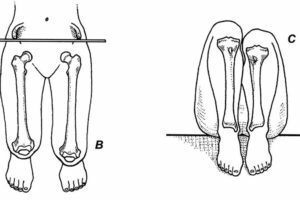 Patients with LLD are expected to exhibit a compensated (weight-bearing) long-leg pattern during gait, typically visualized as foot abduction, pronation, and dorsiflexion. You may also see a variety of findings along the closed kinetic chain, including, but not limited to, knee-joint height and the relationships among the trochanter, posterior superior iliac spine, and iliac crest (Table 2). Figure 7. Center of pressure in the foot through the gait cycle. Left: Patient with a short right leg, without a heel lift. The cyclogram (blue markings) represents the center of pressure through the gait cycle; the gray area quantifies the forward shift in the body’s center of gravity on the short side. Right: The same patient with a heel lift. The cyclogram shows that the center of pressure has been shifted to center and length of stance time is improved; note the change in forward shift shown in the gray area. Arm swing is usually asymmetric and increased on the short-limb side. The great volume of data generated by CAGA notwithstanding, a successful LLD treatment plan will bring these metrics closer to normal. CAGA is particularly useful in determining whether to include a lift in a patient’s treatment plan. In Figure 7, for example, the presence of balanced forefoot pressures but significant disparity in the heel region indicates the need for lift therapy. If the heel of the short side lifts off the ground within normal limits—say, 55% of the stance phase—and pressures in the forefoot are similar to those of the rear foot, we recommend a sole lift. In the case of the patient whose CAGA findings are shown here, pressures met the requirements for a heel lift. Because CAGA also revealed that he was apropulsive, a graded sole lift would aid his forward movement patterns. Two questions remain: How high of a lift does a patient need? And how much height can he tolerate? Place heel or sole lifts under the short limb and follow the changing balance values until numbers are fairly equivalent. Figure 8. Ground force reaction curves in 1 patient’s unlifted and corrected heel. The shaded-green/green line ground force reaction curve represents the overall force distribution through the stance phase of an unlifted heel (1 SD) at contact; this patient requires intervention with a heel lift. 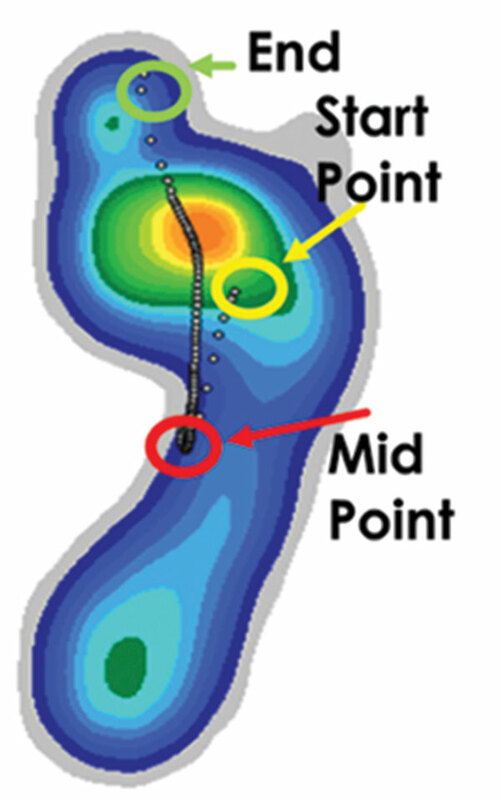 The shaded-gray curve is the more fluid heel-to-toe pattern of the curve after intervention; the gray line represents a healthy force distribution during the stance phase. Left/right and forefoot/rearfoot figures should (in a perfect world) approximate 50%-50% and quadrant pressures should be 25%-25%-25%-25%. forefoot pressures relatively balanced from right to left. Which measurement should be used to determine the extent of LLD? Which exercises should be incorporated? How much lift should be provided initially, and how frequently should the patient be re-assessed and the lift increased? Which finding indicates that it is time to stop increasing lift: absence of pain or correction of the LLD? Or both? When choosing to incorporate a lift, selection of materials is an important consideration. A compressible heel lift composed of open-cellular foam (such as Poron urethane), can be effective in absorbing shock; a more rigid lift, containing high-durometer ethylene vinyl acetate, can provide greater stability and longevity. Studying the impact transient, found as the first event on the CAGA ground reaction force curve, can assist with the decision-making process. We believe that higher initial pressures at contact are best addressed by a compressible heel lift. wearing high-heeled shoes or flip flops, or going barefoot, will have little time to wear a lift. If she refuses to or, for occupational reasons, cannot change her preferred footwear, she must commit to wearing appropriate footwear with the lift at least 1 or 2 hours a day, because inconsistent, nondaily use of a lift usually increases discomfort. If the patient cannot wear the lift throughout the day, we recommend introducing a low degree of lift at the beginning and gradually increasing lift every 6-12 weeks, as tolerated. If the patient will not commit to wearing appropriate footwear for at least 1 or 2 hours a day, we advise against making a heel lift part of the treatment plan. From a rehabilitation perspective, intervention might start with strengthening and stretching, as indicated. Exercises that strengthen core and lower-limb extensors, which often become weak from prolonged sitting or asymmetrical activity, address most abnormal compensation patterns (Figure 9). Exercises such as bridges, sideline hip abduction, and prone hip extension, which stabilize the patient’s core and activate the often-weak extensor muscles, result in long-term improvement. When these exercises are coupled with a lift to address LLD, the patient should be able to return to activity free of pain and relapse. Bear in mind that, because the body goes through compensatory changes when a person has been living with LLD over the long term, adding a heel lift alters those musculoskeletal accommodations slowly and provokes an inflammatory state, which, in turn, will induce tissue remodeling. The goal of treatment is to induce mild, acute inflammation; if the correct degree of lift is introduced gradually, adding a heel lift will not be painful. If the patient experiences pain, the lift height needs to be reduced. Assuming patient adherence, acute causative factors, and minimal musculoskeletal accommodation, we recommend raising the short limb by 50% of the LLD with a graded, sulcus-length sole lift. For example: For an LLD of 8 mm, begin by selecting a 4-mm lift, re-examining the patient every 3 months, and adding height until the biomechanics of the closed kinetic chain are balanced (best assessed by CAGA) and the patient can perform ADL or work without pain. Figure 9. Outcome after improvements in foot strength and lower back tightness. 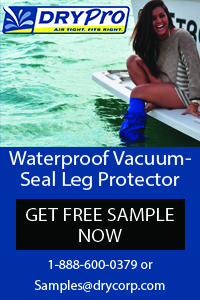 Improvements resulted in 0.75-inch reduction in limb-length discrepancy. Note lateral symmetry bias: The patient usually leans to the long side—mostly likely the result of pelvic overcompensation. Figure. Imbalance before heel-lift intervention. 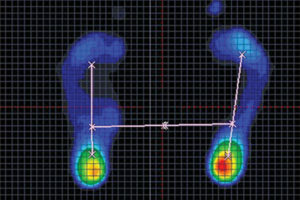 Static CAGA scan reveals imbalance that corrected itself when a graded, sulcus-length sole lift was introduced under the left foot (starting with a 0.25-inch lift and increasing to a 0.50-inch lift, which was comfortable and achieved the balance sought). History. A 64-year-old man was referred to a podiatrist for evaluation and management of antalgic gait and LLD. His chief complaint was pain in the feet and hips. He reported substantial recent weight gain because of pain and a consequent decrease in activity. The patient had been seen for an ingrown toenail on the left foot 3 years earlier, at which point he had asymmetric pronation and greater overpronation on the left—likely a contributing factor in the development and progression of his nail problem on the left foot. At that time, in addition to nail care, CAGA was performed and a recommendation to wear wider shoes and an orthotic was made. The patient reported that he had changed his shoes based on the practitioner’s recommendation. Physical examination. The exam revealed an obese man with a short right leg of 3⁄4 inch that was measured, while he was seated in the examining-room chair with legs extended, from the anterior superior iliac spine to the medial malleolus. The short right leg was also observed by measuring the medial malleoli while he performed a sit-up exercise. Palpation of the lateral plantar surface of the mid-foot on the right side was painful. A spinous callus was located on the first metatarsophalangeal joint of the left foot. An ingrown medial nail margin was observed. The patient displayed an imbalance in muscle strength and flexibility in the leg pronators and supinators and the quadriceps and hamstrings. 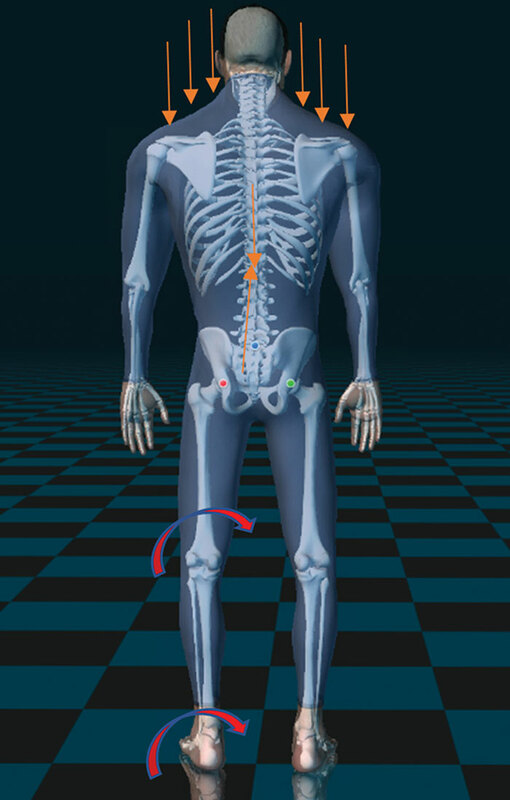 While bearing weight, he had an asymmetric, antalgic posture, leaning to the left with compensation, extending through the closed kinetic chain. Neurological and circulatory systems were relatively unremarkable. Abnormal and unsteady gait with a limp and excessive pressure in the left lateral column and forefoot, and the right medial foot. 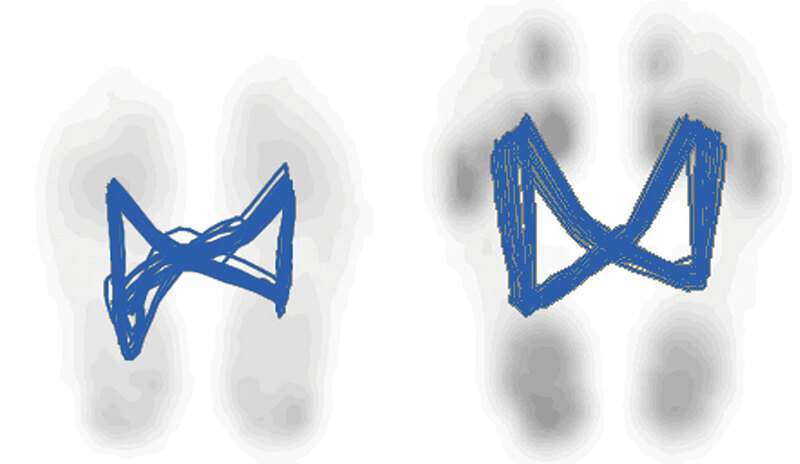 Asymmetric pronation, heel off; impact transient findings (left limb: increased pronation and medial heel impulse, impact tran- sient present but small; right limb: extended but earlier heel off compared to the left [apropulsive gait], higher impact transient and lateral heel impulse, compared to the left). When comparing earlier CAGA to current CAGA, the minimal asymmetry documented 3 years ago had become significant, a progression validated by worsening symptoms. 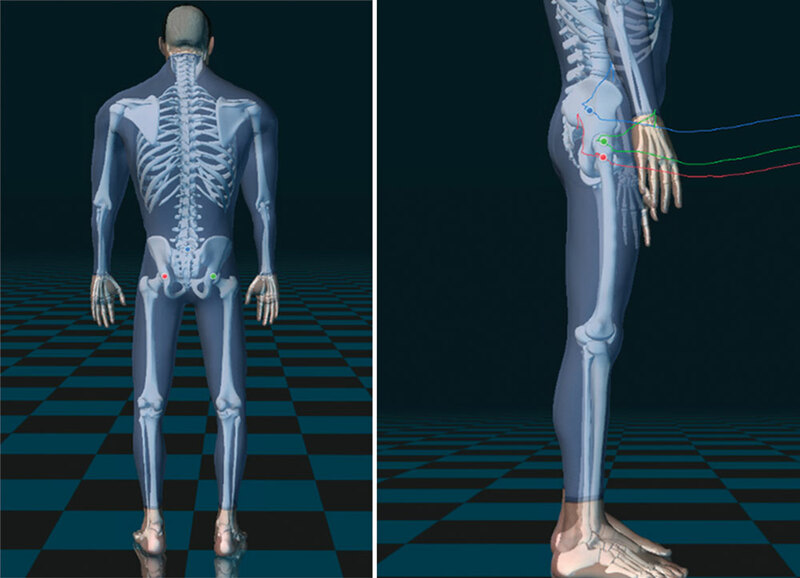 The podiatrist postulated that muscular imbalances (Figure) and skeletal malalignment resulted in biomechanical compensation and contributed to a long-standing, functional, progressive structural (right-hip arthritis) and functional LLD (abnormal compensation to create a functional short left limb). Treatment. It was determined that the patient fit the criteria for LLD treatment with a heel or sole lift. After discussing options, the patient decided to proceed with a heel lift in conjunction with custom orthotics and supportive footwear. Discussion. Notwithstanding the findings of the physical exam and CAGA testing, and other available diagnostic information, the ultimate goal of a treatment plan will not necessarily be achieved at the initial visit. For chronic cases, we recommend that treatment begin at half of the final goal and the body adjust to its new reality with subjective and objective monitoring. Then, height is gradually increased over subsequent weeks or months. Some patient’ proprioception will be affected, changing their pressure distribution so that it appears erratically different from the original findings. If this occurs, you may find that removing the lift does not return the patient to baseline findings. Recognize, and communicate to the patient, that adding the lift is changing neurological input from the feet to the brain. Teach the patient that muscles and joints will move in a different pattern, which is why you start with a low lift. It is also important that the patient be instructed to report pain or discomfort to you. Because a heel or sole lift addresses only 1 plane of movement, a custom orthotic may also be recommended to enable adaptation through the closed kinetic chain (foot, ankle, knee, hip, pelvis, and spine) in all 3 planes (transverse, frontal, and sagittal). You may also need to address gait learned behavior, muscle memory, and recruitment patterns that were adopted by the body to cope with asymmetric function. In other words, now that you have adjusted musculoskeletal alignment, the body will learn different gait strategies through neuromuscular exposure to the sole lift and custom orthotic. This is another opportunity to use CAGA for therapeutic purposes in an LLD patient. By using a treadmill-based CAGA with cameras and a large-screen monitor, you can provide gait training and visual cueing while gathering metrics for comparison as the patient progresses through the treatment plan. Our experience suggests that 12 to 16 visits of the office-based repetitive movement exercises help to retrain the muscles and undo poor gait habits. Whether the treatment plan calls for movement and exercise progression or adjustment and device intervention, we recommend beginning slowly so that the musculoskeletal system, including ligaments, joint capsules, and tendons, can remodel gradually without inducing a robust inflammatory response. During either therapeutic approach, the key is to identify each area of dysfunction along the closed kinetic chain and determine whether the body has compensated for the imbalance. As noted, success is achieved when the patient’s biomechanics have improved and he can perform ADL or work without pain. Most adult patients who have chronic LLD will need to use a lift for the rest of their life. Children and adolescents require periodic reassessment until growth plates fuse. 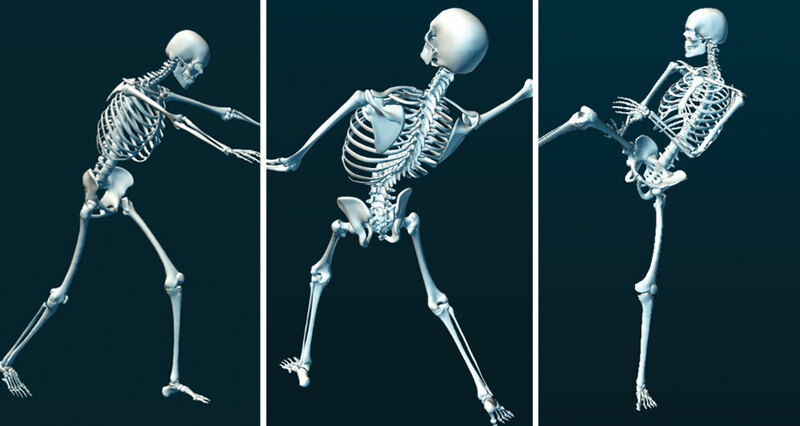 Our aim in this article has been to provide a thorough, evidence-based understanding of 1) how to assess for LLD and 2) the impact of LLD on muscles, bones, joints and movements, as a means to undertake a comprehensive treatment plan. In most cases, LLD patients require a comprehensive, cross-disciplinary treatment plan that might include a podiatrist, physiotherapist, chiropractor, kinesiologist, and athletic therapist. Objective diagnostic and treatment modalities, such as the novel Sanford Symmetry Scale and CAGA, allow for effective communication with the patient and within a cross-disciplinary team; provide metrics to design an LLD treatment protocol; and can be used monitor a patient’s progress. Jay Segel, DPM, is in private podiatry practice, Martha’s Vineyard, Massachusetts, and is Director of Applied Podiatric Biomechanics at Noraxon USA, as well as a podiatric advisor and member of the medical education staff at Orthotic Holdings Inc. Susan Sanford PT, L.Ac, C.SMA, is President and Chief Executive Officer, Vineyard Complementary Medicine, West Tisbury, Massachusetts. Sally Crawford, MS, is Chief Operating Officer and Director of Biomechanics, Resilience Code, LLC, Englewood, Colorado. Lori Yarrow, DC, BPE, is a marketing and education consultant in the orthotics and medical devices industry. Sources: Figures 1,2, 4-11: CAGA screenshots by author (using myoMOTION and myoPRESSURE technology with MR3 software [Noraxon USA, Scottsdale, AZ]). 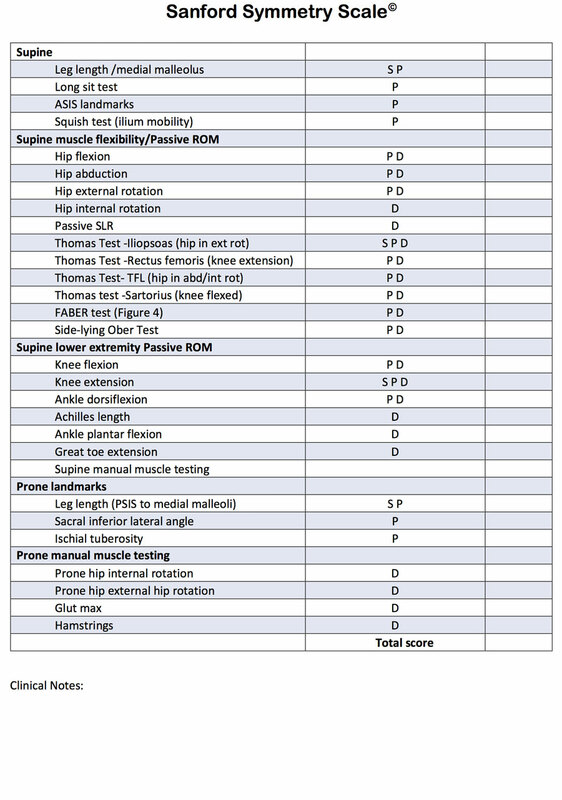 Figure 3: Lower Extremity Review (2016). Sanford Symmetry Scale is Copyright © Susan Sanford, PT, L.AC, C.SMA. Badii M, Wade AN, Collins DR, et al. Comparison of lifts versus tape measure in determining leg length discrepancy. J Rheumatol. 2014;41(8):1689-1694. Eliks M, Ostiak-Tomaszewska W, Lisiński P, Koczewski P. Does structural leg-length discrepancy affect postural control? Preliminary study. BMC Musculoskelet Disord. 2017;18(1):346. 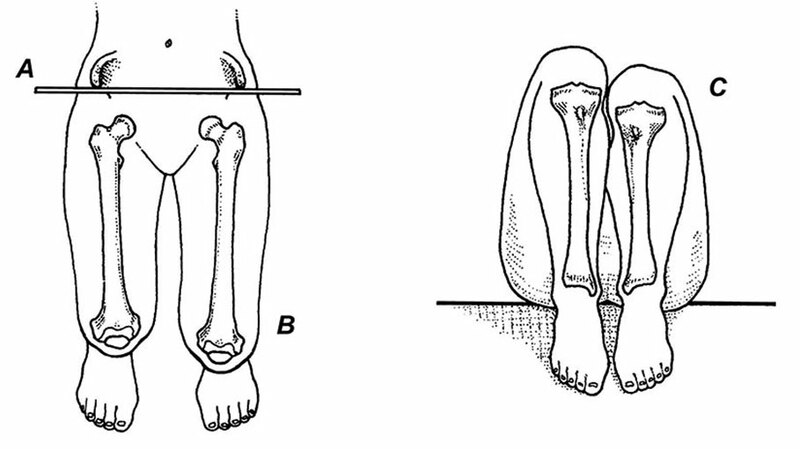 Subotnick S. Limb length discrepancies of the lower extremity (the short leg syndrome). J Orthop Sports Phys Ther. 1981;3(1): 11-16. Michaud T. Human locomotion: The conservative management of gait-related disorders. Newton, MA: Newton Biomechanics; 2012.